This post will show you how to build your own metal detector from the Surf Pi 1.2 pulse induction kit. Ive recently been getting into metal detectors as a hobby for the past few months…Despite being for “old retired men” and nerds, metal detecting is fun to do with a friend, the family, or by yourself. Its pretty entertaining, and I think everyone should give it a try. I think my only qualms with the hobby are the high prices for a capable metal detector. Some such as the Minelab, Whites, and Tesoros go for around $400-600 used (and those are the base models)! Personally, an investment of that cost is nearing the edge of what im willing to spend. I remember when I was young, my dad got me a metal detecting kit which piggybacked off an am/fm radio (I found nothing but soda cans and batteries in my backyard)…ever since then though, I was always interested in the hobby. As for gear now, I have a Bounty Hunter Tracker IV which I find is a very good detector for around $100 (I prefer it to the Fisher F2), and a Tesoro Sand Shark which I purchased off ebay for $425. Both detectors work well for their applications (BH tracker IV for land use, and the Tesoro Sand Shark for use at the beach and in salt water). 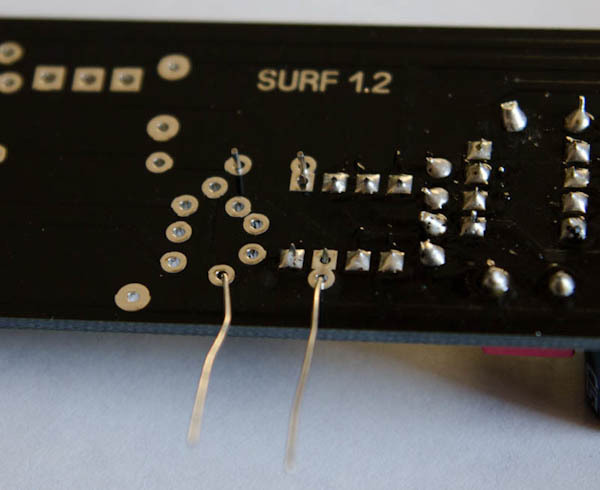 Anyways, back to the DIY metal detector topic…After purchasing my Sand Shark (for more than I wanted to spend), I noticed how small and relatively simple the circuitboard was. This got me thinking about whether or not there were some DIY methods of building a detector which would cut the costs and lower the barriers to entry for the hobby (while still using high quality gear). What I found were forums packed with very intelligent people working on homebrew detectors, schematics, circuits, and designs with the electrical engineering knowledge to make very interesting and cost effective metal detectors. I was delighted to find several schematics for Pulse Induction, VLF, and CCO detectors on the Geotech forum. What I didnt find however, were simple instructions and details on how to go about building them as the information was scattered and often times incomplete since most people had an understanding of what to do already (most seemed to have a very good understanding of EE). So I did what I do best, I hit the forums and read as much as I could researching, messaging, and figuring out the best detector kit for the money and ease of build for someone who didnt know how to read a circuit schematic. This blog post is to help those who want to build a DIY metal detector kit for a lot less than a commercial detector, yet still have the advantages of a great quality machine with options for future performance enhancements and tweaks…oh yeah, and save some $$$ as well! 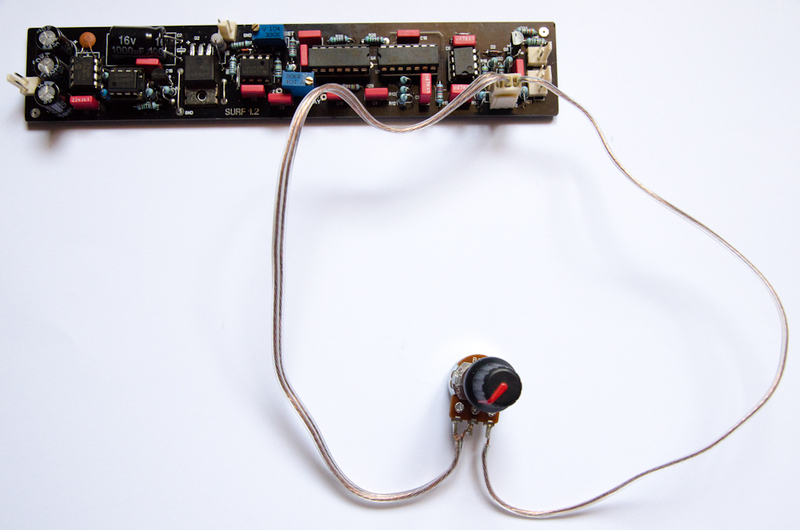 I thank the great minds over at the Geotech Forums such as Silverdog, 6666, Tepco, and others who have answered my questions and posted their findings and explanations to help others in building a detector from the kit to the coil. OK, on to the instructions! 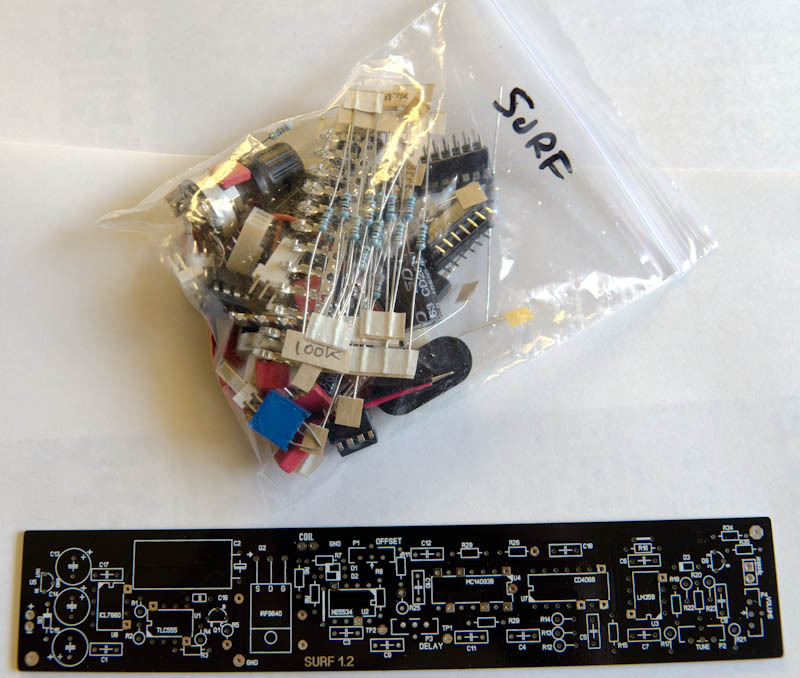 Step 1: Getting the Surf PI 1.2 Pulse Induction Metal Detector Kit and parts. Go to http://silverdog.co.uk/ and buy the Surf PI 1.2 kit (these are dirt cheap, work very well, and are easy to build!) I got two kits for under $90 shipped to California. Andy runs the shop (and is an avid forum poster) and gives lots of help to those who purchase his kits and run into problems. I highly recommend him! The Surf PI 1.2 kits come with everything you need to make a fully functioning PI metal detector. However, you will need to get creative and figure out what you can use to make the coil (ill show you how later), metal detector shaft (pvc pipe, wood, cut off crutches, etc), coil and board housing (can be anything such as a waterproof case/see optional SKU, and bucket lid), coil connection to circuit board (some rg6 or usb cable), and power supply (which ive already provided links above). Once you have everything in hand, you’ll first want to check out all the parts and sort them out onto a work area, This helps you see your progress and also keep things somewhat organized. Here are a few snapshots of the components which are included in the kit. Its not as complicated as it seems, just work slowly and be careful. There’s basically two things you have to do to build this board, look at the silk-screened component markings, and reference the PARTSLIST to see which component goes there. For example, in the picture below, you will notice the marking “U5.” In the partslist, you will scroll down till you see U5 and then reference which part is used. In this case its the 78L05. Easy Peasy. Since ive built two of these units, I did have a few suggestions which might be useful for those who are attempting this for the first time. Build the board from Left to Right with the Power Supply on the Left. For the Power Supply Capacitors (see above picture), do a dry run to fit them on the board all at once without soldering them into place. On one kit I built, slightly wider caps were included which took a bit of adjusting to get them to seat nicely with each other. Also pay attention to capacitor polarity. The negative lead is shorter and marked with a grey ‘-‘ stripe on the cap itself. On the Surf PI 1.2, two caps are situated in one direction and the third is opposite the other two (look at the picture above). 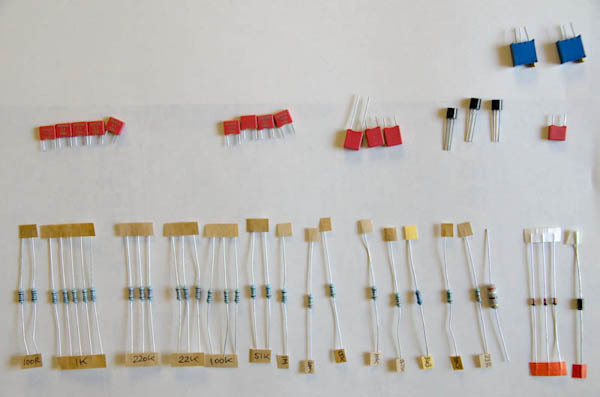 There are Five (5) 100nF [Polyester film (+/-10%)], and Four (4) 1nF [Stacked Polyester film (+/-5%)] resistors (my kit were red colored Wima 0.1 and 1000 resistors). Before you start, mark them and keep them separate. While building, its easy to lose track of which are which since they look nearly identical and the markings on the resistors dont easily identify them (at least I couldnt figure it out). When you get to the solder bridges just reuse the cut off leads from the caps or resistors. When you get to soldering components located near the molex connectors for the coil, power supply, volume, and threshold, do a dry fit to make sure you leave enough space so the components do not interfere with the connectors. I needed to do some adjustment near the R6 and coil connection for the molex connector to fit nicely. 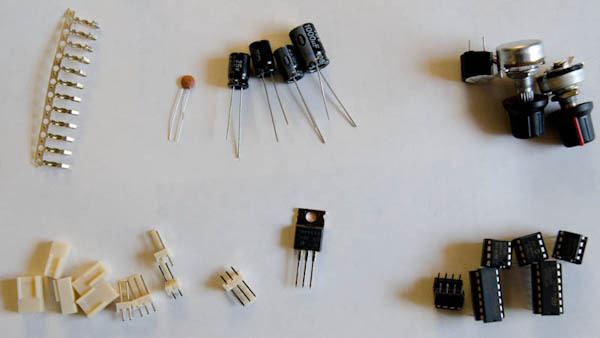 If there are several solder holes which interconnect components on the board, fit all the components through first before attempting to solder each individually. Sometimes solder flows too easily and will clog the unused holes. Its best to fit them all at once. Work slowly and carefully, double check each component to ensure the right part is being used. Remember, resistors are not sensitive to polarity orientation, but capacitors are! 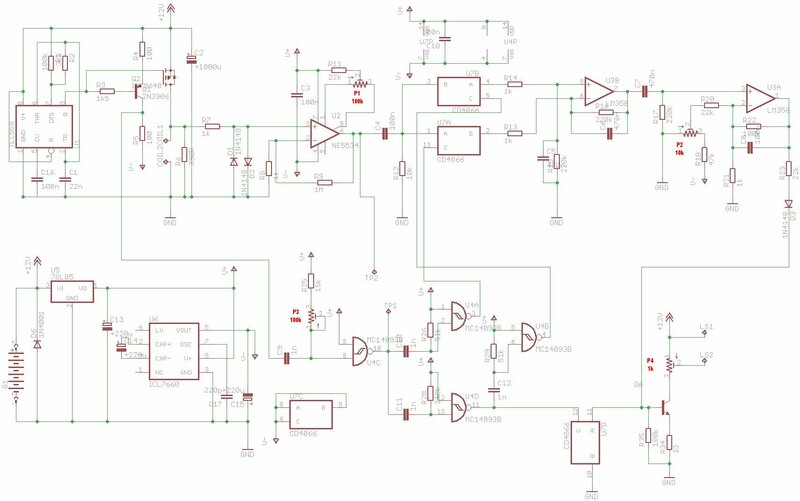 It seems to me that the most difficult and elusive concepts to grasp of making any detector is building the coil and matching it to the metal detector circuit. While reading the Geotech forums, countless threads are dedicated to just that, however, there are so many variables in doing so I got a little overwhelmed. After trying out several suggestions, I’ve found that the best option is just simply to build an unshielded mono spiral coil using the concepts Tepco has written about on this thread. 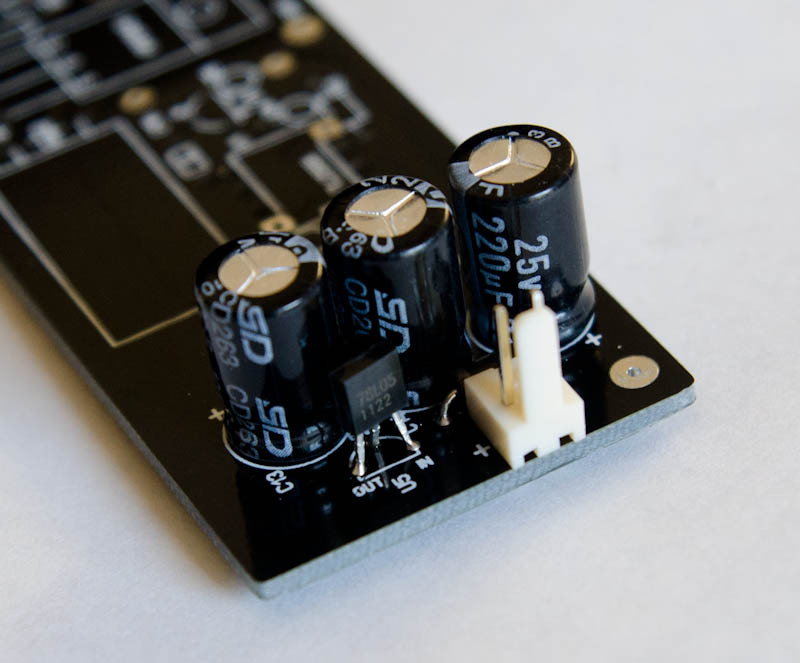 Its easy to build, gives consistent results, and allows for further modification to the delay sensitivity if desired. For the purpose of this tutorial, ill just concentrate on how to make a non-shielded coil, but one can easily adapt this design for use with a shielded application. PI units dont require a shield, but those on the forums have found it helps with ground balancing…if made with the correct materials. I tried to use this coil with an aluminum foil faraday shield but was unsuccessful as the coil detected the aluminum foil. Anyways, on to building the coil! 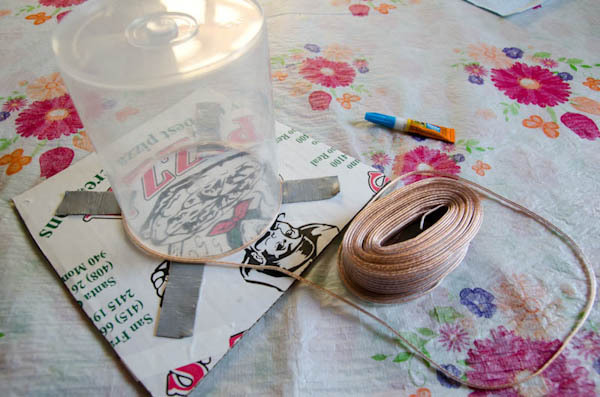 Essentially, you’ll set up a coil winding apparatus like the one in the picture shown below and then wind the speaker wire on its thin edge (towards the cardboard) for 30 turns (my coil tested to 1.4ohms using a multimeter). The double sided tape keeps the dvd spindle stationary, and allows the wire to be temporarily anchored to the base while you are winding. Put a few dabs of super glue as you wind so the coil will stay tight. For added strength, I ran a bead of super glue down the 4 cardinal points of the coil and cut small strips of plastic from the super glue blister pack to press onto the beads. 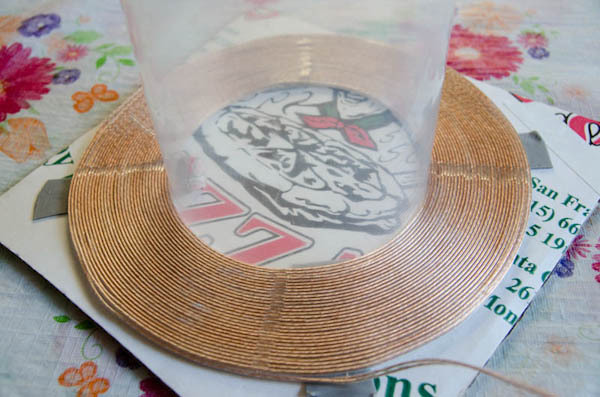 When the glue dries, you can use a flat butter knife and slide it under the coil near the double sided tape to pop the coil up from below, and remove it from the tape. When you’re done, strip and twist the loose inner coil strands of wire together. Repeat this for the loose strands at the outer end of the coil, so the two speaker wires function as one wire running parallel the length – this is to reduce wire resistance. 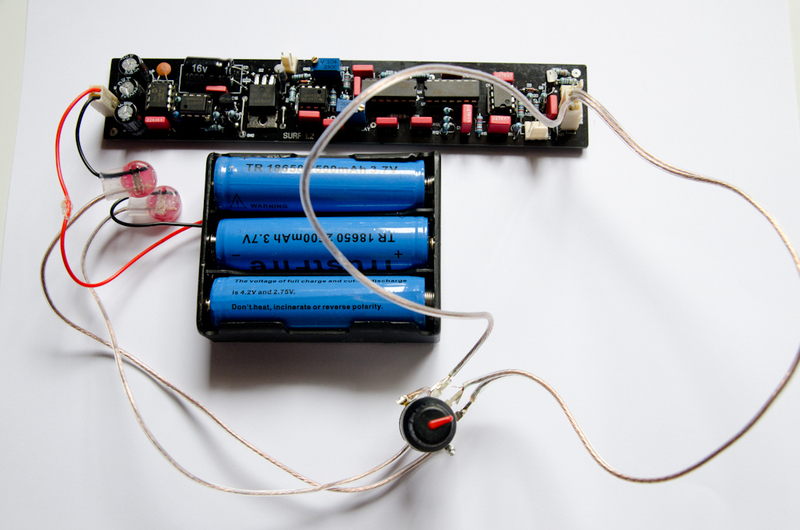 To connect the coil to the detector, connect the inside leads of the coil to the “+”, and the outside leads of the coil wire to the “-” on the circuit board. Dont worry if one of the wires overlaps the face of the coil. 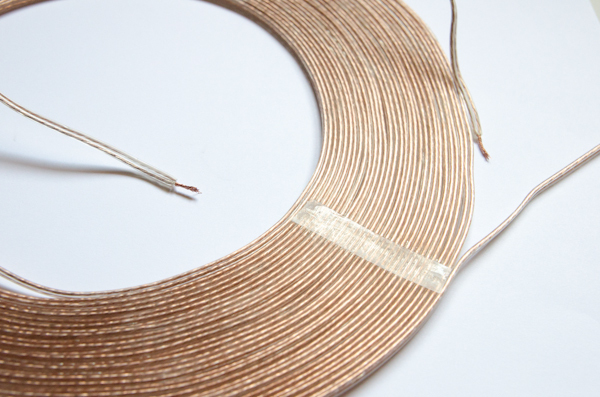 For quick testing, use a 3-4′ length of the same speaker wire to connect the coil to the board. If the coil is sitting on or very close to any metal, you may find you cannot detect anything. Test the coil away from any metal work bench, table, or counter which has any metal in or on it. The best option is to take the whole detector kit outside to test away from any RF or electrical interference, such as electrical wires or wireless routers. To permanently connect the coil to the circuit board, one can use a shielded USB 2 cable or RG6 coax (center contact to inside leads of the coil, outside leads of coil to cable shield). After you’ve connected the coil to the detector, theres a few adjustments which need to be made so you can get the best performance from the kit. You’ll need a multimeter and a small flat-head screwdriver (like eyeglass repair size) to tune the Offset and Delay trimmers. 1. Turn the unit on (volume knob, or just plug in the battery pack) and see that everything is working as it should (you should get an audible response from adjusting the volume and threshold potentiometers). Set the threshold potentiometer till you have a steady tone which is just above silence. 2. Next lets tune the offset. The offset needs to be set to 0v DC. Connect the multimeter positive lead to pin 6 of the NE5534P and the negative lead to ground. It helps to have someone turn the screwdriver for the next step. 3. Use the flat-head screwdriver to turn the Offset trimmer (circled in red below) till you get 0v reading on the multimeter. Next you will have to adjust the delay till you can detect some gold/coins/metal. Get a gold ring and wave it over the coil. Use a flat-head screwdriver to turn the Delay trimmer till you are able to detect a gold ring at its greatest distance. I had the greatest sensitivity to gold and coins when I turned the dial all the way clockwise (I heard clicking from the trimmer signifying its maximum). For reference, I am getting about 11-12″ detection on a US Nickel, faint signal at 10″ on a US quarter, and the same distance for a medium sized white gold ring. For a very thin white gold eternity ring (with miniature diamonds all around it), I get about 5-7″ detection (interestingly enough, when compared side by side with my Tesoro Sand Shark, the Sand Shark only gets about 6″ of depth maximum for any of the above items…so relatively speaking, this kit is wonderful!). This seems to correlate with the others on the Geotech forum who have built this machine using the stock components. However, this detector has the capability to be tuned to be more sensitive by swapping some components. To learn more about how to do so, check out post #31, #33, and #35 by Tepco on this thread. You should now have a fully working pulse induction metal detector capable of finding tons of stuff at the beach. One just needs to figure out how to house the coil, board, and appropriate controls. For more information and ideas on how to do so, check out the Surf PI thread on Geotech. Since this detector is essentially a White’s Surfmaster Pi unit, check out the manual on how to adjust the delay and other useful bits of information on detector usage. Need to build a metal detector shaft? For instructions on how to build a straight shaft to use with this (or any) metal detector, see my post here. Need ideas and a source on coil housings? Check out my post on how to use a thermo-formed plastic clamshell to build a durable (and good looking) DIY metal detector coil housing.